An interview with Msgr. Peter Wilkinson, a former Anglican bishop who realized the “dream” of full communion with the Roman Catholic Church. Msgr. Peter Wilkinson, 74, is a retired Roman Catholic priest who assists at St. Columba’s Church in Victoria, British Columbia, Canada. He is also a former bishop in the Continuing Anglican movement, a group of traditional Anglicans who, in 1977, separated from the more liberal Anglican Communion. Msgr. Wilkinson was born and raised in Victoria, the seat of government in British Columbia, located on the southern tip of Vancouver Island. He entered the Anglican seminary in England and was ordained to the Anglican priesthood in 1965. After nearly 50 years of ministry, Wilkinson donned a coat and tie and entered the Roman Catholic Church as a layman in 2012. He was ordained to the Roman Catholic priesthood eight months later, under the authority of the Personal Ordinariate of the Chair of St. Peter, whose ordinary is Msgr. Jeffrey Steenson, himself a former bishop of the Episcopal Church. The ordinariate was created by Pope Benedict for Anglicans seeking full communion with the Roman Catholic Church. Msgr. Wilkinson recently spoke to CWR. CWR: What was the Anglican Church like in Victoria when you were a boy? Msgr. Peter Wilkinson: It was strong. That was the 1940s and 50s, and many people were active in the Anglican Church. About 75 percent of the residents were Anglican. As a teenager, I’d go to services at Christ Church Cathedral and the only seats would be in the gallery. I attended an Anglo-Catholic parish [emphasizing Anglicans’ Roman Catholic heritage] with a beautiful traditional liturgy. It is the liturgy I came to love. It was while I was in university that I became interested in religious life. I had read a book by an Anglican religious who was a Franciscan friar. I thought, “That’s what life is about, being a Catholic Christian.” I wanted to be a priest and religious, and experience the beauty and joy of Catholicism. When I graduated from university, I made an arrangement with the Anglican bishop of British Columbia to go to an Anglo-Catholic seminary in England operated by the fathers of the Community of the Resurrection. CWR: When you said Catholicism, you meant as an Anglican. Msgr. Wilkinson: Yes, Anglo-Catholicism. When I converted to Roman Catholicism, I didn’t have to unlearn any doctrine, but it took a while for me to understand the papal office. I think it has been the same for other Anglican clergy who have converted. CWR: What was your opinion of the Roman Catholic Church as a young man? Msgr. Wilkinson: It was good. Most of the devotional books we used were based on Roman Catholic books. As I said, I didn’t understand the doctrine of papal infallibility very well, but once you do understand it, it’s a no-brainer. But much of what we did was the same as Roman Catholicism: Mass, praying the Divine Office, confession, private prayer. CWR: Unlike many Anglican clergy, you chose not to marry. Msgr. Wilkinson: Yes. I had entered the Community of the Resurrection, where I went to seminary and was a novice for a time. Even though I later left, I took seriously the vows I had made. CWR: What led you to become a Roman Catholic? Msgr. Wilkinson: The 1960s were taking over. People began to drift from sound doctrine. The liturgy was changing. There was a general malaise in the Church. I was serving as a priest in England, and it was a difficult time there. The Zeitgeist seemed to be in charge! Pope Benedict himself has commented that 1968 was an axial year. There seemed to be a shift in consciousness. There were Marxist riots in Germany, race and anti-war riots in the United States; and Woodstock the following year! It was an unhappy time. Religious life was affected too, and I could not remain in a religious community that seemed to have lost its way. I returned to Canada, where the same things were going on, but at least I was home. I thought my home diocese would employ me. However, I was branded as “Catholic” and not accepted, as were many of my friends. CWR: What were some of the issues that led you to leave the Anglican Communion? Msgr. Wilkinson: All the things people talk about, like women in the priesthood, and divorce and remarriage at will. There were also changes in the liturgy, like gender-neutral ordination services or transforming confirmation into a “sending forth” ceremony. All these things were watering down the faith. The result was that in 1977, there was a Congress of Concerned Churchmen in St. Louis, Missouri. Afterwards, many men and women separated from the official Anglican Communion. Thousands left to form continuing Anglican bodies. Eventually the largest group was the Traditional Anglican Communion (TAC), a worldwide communion of national “Anglican Catholic Churches,” including those of Africa and India. Reunion with Rome was the dream of many Anglo-Catholics from the time of King Charles I (1600-49), who was married to a Catholic. In fact, attempts at reunion were made at various times right into the 20th century. Nor should one forget the Pastoral Provision of St. John Paul II for married priests in the Episcopal Church. I remained the archbishop of the Traditional Anglican Communion in Canada until the day I was received into the Roman Catholic Church. CWR: So, the Anglican Communion of today is nothing like the Anglican Church of your youth? Msgr. Wilkinson: No. Not at all. You can be a “partnered homosexual” and still be a priest or priestess in the Anglican Church! CWR: John Henry Newman, the famous English convert from Anglicanism to Roman Catholicism, is prominently quoted on your parish website. Was he an influential figure to you? Msgr. Wilkinson: Yes, as was the whole Oxford Movement of the 19th century. For Newman, his conversion was a matter of being faithful to the truth. He initially knew little about the Roman Catholic Church, but his honest study led him into it. CWR: You’ve had some interaction with Pope Benedict? Msgr. Wilkinson: In 1986, I read his book Seek That Which is Above, published by Ignatius Press. It is a beautiful little book drawn from his time while serving as archbishop of Munich. I was impressed by its simplicity and depth; it reminded me of work by some of my favorite Anglican writers. I read his works more and more (thanks to Ignatius Press! ); today, I have two shelves of Ratzinger books. 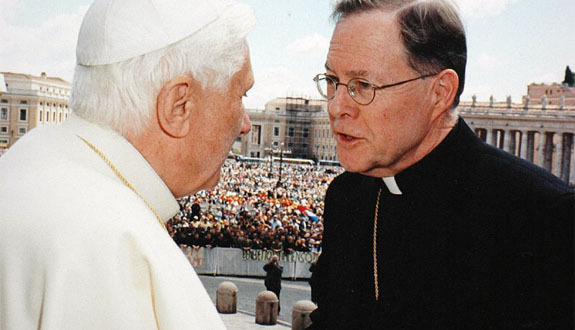 When I was ordained an Anglo-Catholic bishop in 1999, I wrote to Cardinal Ratzinger telling him that the norm of my teaching was the Catechism of the Catholic Church and of my desire for full communion with the Holy See. He replied and sent me an autographed copy of his The Spirit of the Liturgy. He was always ready to communicate with Anglicans wanting to come home. In 2007, the Traditional Anglican Communion decided to hold a synod to see if we were ready for full communion. We met in Portsmouth, England. One hundred percent voted for full communion. Each Anglican bishop in attendance signed a copy of the Catechism of the Catholic Church, indicating our acceptance of its teaching. I was one of those chosen to take that Catechism and an official letter from the TAC bishops to the Congregation for the Doctrine of the Faith. In 2009, Pope Benedict issued the apostolic constitution Anglicanorum Coetibus that created personal ordinariates for Anglicans so they could come into full communion. They have done so in the United Kingdom, Australia, and North America. CWR: Did you meet personally with Pope Benedict? Msgr. Wilkinson: I was scheduled to meet with him in 2005 while he was still at CDF, but Pope John Paul II had died only a few days before. Our meeting was, of course, cancelled as he was arranging the conclave that elected him pope. I had a second chance in 2007. I met him after a general audience. Being looked at by Pope Benedict is something you don’t forget. He seems to look into your soul. I took his hands and I didn’t want to let them go! He remembered me, and the TAC bishops’ desire for full communion. He told us to keep praying. CWR: When you became a Roman Catholic, you donned an ordinary coat and tie, and entered as a layman. Was it difficult, after being a member of the clergy for nearly 50 years? Msgr. Wilkinson: It didn’t matter to me at all, even though I was uncertain of my future in the clergy. I made the profession of faith, was confirmed and received Communion for the first time as a Roman Catholic in St. Andrew’s Cathedral in downtown Victoria. The bishop of Victoria presided, and Msgr. Steenson preached. Our local Catholic bishop, Richard Gagnon, who is now archbishop of Winnipeg, had been a good friend to us former Anglicans. He and his Vicar General couldn’t have been any better. I was ordained to the Roman Catholic priesthood on the Feast of the Immaculate Conception, December 8, 2012. A month later, the Holy Father surprised me by making me an Honorary Prelate [with the title monsignor]. CWR: Tell us about your parish church, St. Columba’s. Msgr. Wilkinson: It’s a small, wooden church, more than 100 years old. We rent it from the local Anglicans. They wouldn’t rent to us if we were Continuing Anglicans, as we’d be perceived as competition for parishioners. But now that we’re Roman Catholics, they don’t mind. It had originally been up for sale. Anglican churches all over Vancouver Island have gone up for sale, as they have closed due to declining membership. But that’s happening all over. In England, I’m told that more Roman Catholics go to Mass than members of the Church of England. We have four priests, two in my age range and a third about 10 years younger. We have about 35 or 40 parishioners who come from all over lower Vancouver Island. The Ordinariate Mass can begin with the prayers at the foot of the altar and end with the Last Gospel, as you’d have with the Older Latin Mass. The Roman Canon is said in English, using a historic Anglican form. It is said ad orientem; the tabernacle is on the altar along with six candlesticks. The Sunday Mass is sung, as it is for other important feast days, such as the Feast of Our Lady of Walsingham, the Patroness of the Ordinariate in North America. Our hope is to buy a church of our own in the future. Right now, we don’t even have access to the parish hall, as it is used by a daycare. During the week, our priests may also be found helping out at other parishes, saying the Novus Ordo or the older Latin Mass. CWR: On your parish website, you have posted the three non-negotiables: 1) the protection of human life, 2) recognition of the natural structure of the family, and 3) the right of parents to educate their children. Why have you chosen to stress these issues? Msgr. Wilkinson: Canada has no abortion legislation, whatsoever. A cat has more rights than an unborn child! So these views are not common around here, and we want people to know where we stand. The Anglican Church of Canada has never been pro-life, at least not vocally or by standing up for the sanctity of human life. We, in contrast, take part in the local pro-life movement and support the teaching of the Catholic Church. Every May, we join in an annual pro-life march. CWR: Was it hard leaving the Anglican Church to become Catholic? Msgr. Wilkinson: No, I recommend it! But you have to have the faith and the grace to believe the Catholic Faith. I think you will see more Anglicans converting to Roman Catholicism, because with the ordinariate it has become more mainstream. It was comfortable being an Anglican. It was like living in a nice den. But, when I became Roman Catholic, it was like throwing open the door to a magnificent ballroom and the rest of the world is out there waiting to welcome you.